HOUSTON, and LONDON, Jan. 19, 2017 /PRNewswire/ -- LyondellBasell (NYSE: LYB), one of the world's largest plastics, chemical and refining companies, today announced completion of the 800 million pounds-per-year ethylene expansion project at the company's Corpus Christi, Texas, site. The project increases ethylene capacity at the facility by 50 percent, from 1.7 billion pounds-per-year to 2.5 billion pounds-per-year, and completes the company's multi-year plan to increase annual ethylene capacity in the U.S. by two billion pounds. "As we look to meet growing, global demand for our products, we continue to seek the right opportunities that ensure we are well positioned for the longer term," said Bob Patel, LyondellBasell CEO and chairman of the management board. "By expanding ethylene capacity in the U.S. through debottlenecks rather than long and costly greenfield developments, we quickly added substantial capacity for significantly less than the cost of a new plant," he added. 120 million pounds-per-year combined ethylene/polyethylene increase – Clinton, Iowa and Morris, Ill. Since 2012, LyondellBasell has invested approximately $2 billion in U.S. Gulf Coast expansion projects and plans to invest an additional $3 billion in the region. 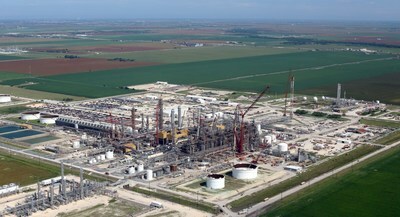 In September, the company announced the construction of a high density polyethylene plant (HDPE) in La Porte that will be the first to utilize LyondellBasell's new proprietary Hyperzone PE technology. HDPE is one of the most versatile plastics because it is lightweight, yet very strong; impact resistant; weather resistant; it can be molded into almost any shape and is widely recyclable. Construction is scheduled to begin in early 2017 with start-up planned for 2019. Additionally, development of a world scale propylene oxide and tertiary butyl alcohol (PO/TBA) plant at the company's Channelview site is progressing. Ethylene is a basic chemical building block used in consumer products such as housewares, construction materials, automotive parts, food packaging and personal care products. Global demand for ethylene has consistently grown at a 4 percent annual rate, according to IHS Markit.